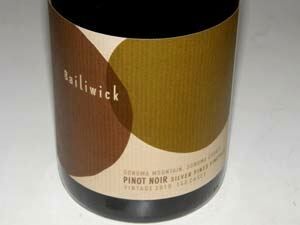 Last year I discovered Bailiwick Wines, a partnership between brothers Bryan and Paul Vais. 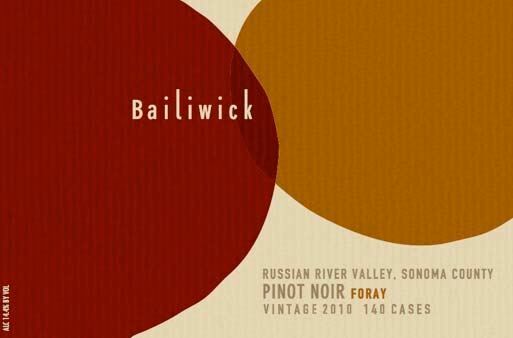 As I noted then, “Once in a while a new producer seemingly comes out of nowhere and really impresses me.” The four 2009 Bailiwick Pinot Noirs were stellar, exemplifying deft winemaking, and the labels, marketing program and website were intriguing. I subsequently met the brothers at wine tasting events and warmed to their unabashed enthusiasm and modesty. 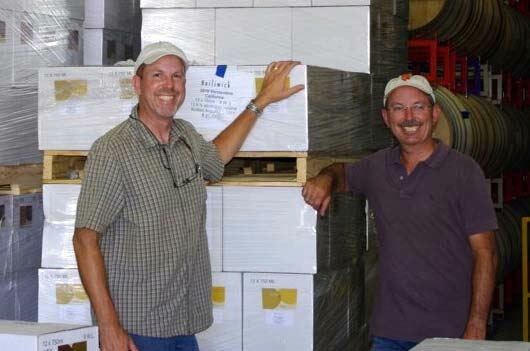 Bryan and Paul are natives of the San Francisco Bay Area who have been making wine in their home basements and various garages for 25 years while they pursued successful careers in engineering, technology and finance. 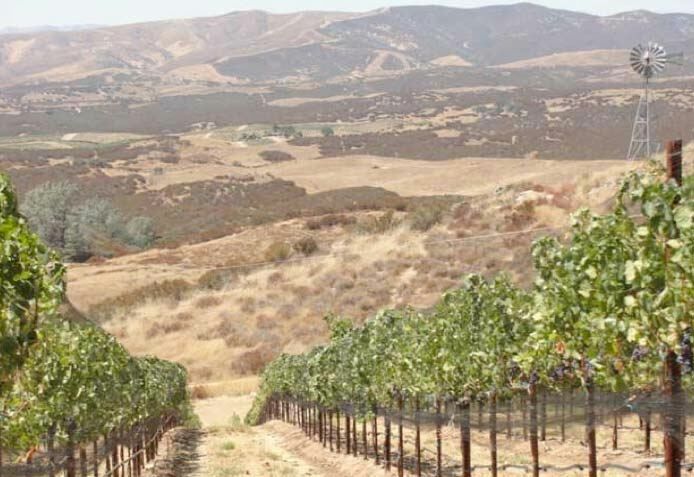 In 2009 they launched a commercial venture, intent on producing premium Pinot Noir from specially chosen vineyards across multiple California appellations. 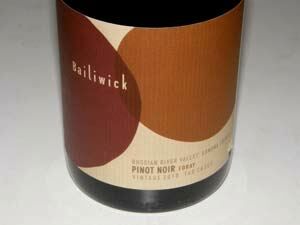 The name they chose, Bailiwick, refers to a person’s special field of interest, authority or skill, in this case wine. The brothers come from a family of great cooks and are foodies themselves, and the wines they produce reflect that background in the suitability if their wines for the dinner table. I recently sampled six new Pinot Noir releases from the challenging 2010 vintage and I am happy to report that these wines were even better than the previous vintage and superb across the entire lineup. This producer is no one trick pony. The AVA blends are released now and the single vineyard wines will be available in November. 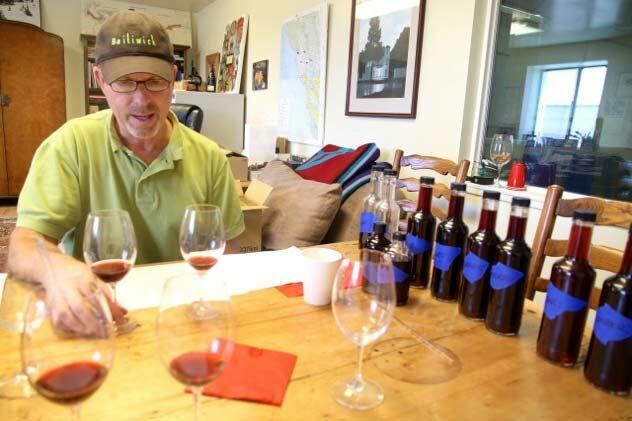 Two new wines were added in 2010: a Sonoma Coast AVA bottling and “Foray,” a single vineyard bottling representing a chance to get some extraordinary grapes under unusual circumstances. Paul told me the following. “2010 was a very difficult vintage, and we are doubly pleased that our wines turned out so well. We were well prepared for the September heat spikes and executed well to get grapes into the winery before they were ruined. In general, the fruit came in with reasonable levels of ripeness, acidity, etc.. 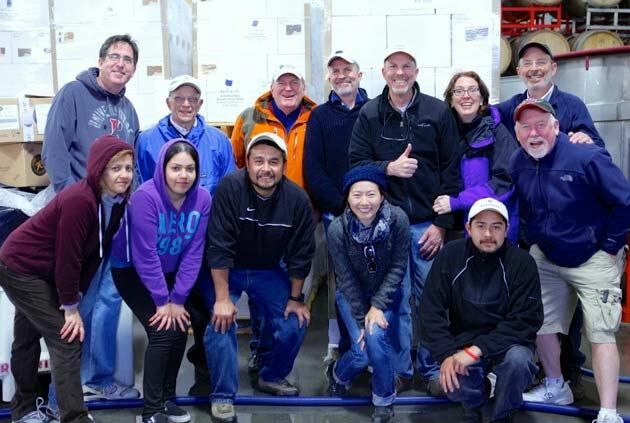 Nonetheless, we managed to make six really nice pinots that we are proud to offer.” The photo below is of the entire work crew who look very happy. My general impressions of the wines were as follows. The aromatics are lagging the flavors at this early stage, which is to be expected, but they are still alluring. Each wine is distinctly different but there is a common thread of impeccable balance, admirable oak integration, and complimentary tannic structures, done in an elegant, gentle style: all you can ask for in California Pinot Noir. It is rare to have such a diverse portfolio of grape sources handled so adroitly. It was difficult for me to make discerning qualitative judgements as all the wines were excellent. The grapes for all wines were hand picked and sorted, 100% de-stemmed without crushing and fermented in open top containers. After a 3 to 4-day cold soak, commercial yeast was added to drive fermentation and highlight varietal aromas. Gentle punchdowns were performed three times a day. Post-fermentation maceration on the skins lasted several weeks. The wines were pressed off into French oak cooperage where they were aged for 17 months. 14.3% alc., pH 3.81, TA 0.62, 350 cases, $36. Drawn from three vineyards (41% Dutton-Lorenzo, 46% O’Neel, 13% RLR). Several clones including 115, 667, 777 and Pommard. Aged in 35% new French oak barrels. · Moderately light reddish-purple color in the glass. This is quintessential Russian River Valley Pinot dialed back in intensity: unplugged if you will. Initially shy aromas pick up intensity over the time in the glass offering scents of Bing cherries and baking spices. Delicious, deep cherry flavor on a silky framework in an intensely flavored, mid weight, elegant style, finishing with an appealing slinkiness. Silky tannins make for immediate accessibility. Very good. 14.4% alc., pH 3.66, TA 0.53, 140 cases, $40. From The RLR vineyard located just outside Forestville. Soil is Goldridge sandy loam and clones are 113, 114 and 115. Aged in 33% new French oak barrels. · Moderately light reddish-purple color in the glass. Shy aromas of earth-kissed black cherries, forest floor and deep red rose petals. Richer and more deeply flavored than the Russian River Valley bottling, endowed with a perfectly ripe core of sappy, dark red and black cherries and raspberries, supported by smooth oak and fruit tannins, and finishing with very impressive length. Still young and undeveloped, but displaying impeccable balance that predicts an optimistic future. Clearly special. 14.2% alc., pH 3.66, TA 0.64,140 cases, $44. Growers are Norm and Carole Silverman. The vineyard overlooks Bennett Valley from an elevation of 900 feet. Planted in 2000, the loamy-clay volcanic soil is low in vigor limiting yields to about 2 tons per acre. Clone 115. Aged in 34% new French oak barrels. · Moderately light reddish-purple color in the glass. Nicely perfumed with aromas of dark red fruits, cardamom spice and candied rose petal. Juicy red cherries and berries saturate the mid palate, embellished with spice and magic. Healthy, but non-aggressive fine-grain tannins add grip and support. Still young and takes its own sweet time opening up. Tremendous finishing power with fruit coming and going in waves. Cellar this another year or two and you will be happily infatuated. 14.9% alc., pH 3.66, TA 0.64, 120 cases, $44. This vineyard sits at 1600’ above the Salinas Valley floor at the entrance to the Pinnacles National Monument. Decomposed granite and limestone are at the surface. Farmed by Michael Michaud, a former winemaker for Chalone during its glory years. Clones 115, 667, 777 and Swan. Aged in 40% new French oak barrels. · Moderately light reddish-purple color in the glass. Delicate aromas of fresh blueberry-pomegranate juice and assorted dark fruits. Somewhat earthy, burly and rustic, displaying a hearty core of delicious purple and black fruits backed by ripe, firm tannins. A very elegant presentation that is unusual for this vineyard in my experience. Highly terroir-driven. Very good. 14.4% alc., pH 3.69, TA 0.56, 100 cases, $36. Sourced solely from the Kendric Vineyard farmed by Stewart Johnson. Clones 115 and 777. Aged in 50% new French oak barrels. · Moderately light reddish-purple hue in the glass. A panoply of scents including black cherries, pie berries, clay, oak, and white chocolate that come and go in the glass. Strikingly fresh berry flavor, seemingly wild and exotic, underlain with well-integrated oak and supple tannins. Unusually ripe for cool Marin County. An evocative middleweight, that enters with aplomb, and finishes smooth and polished. I really like this Pinot. 14.4% alc., pH 3.76, TA 0.64, 270 cases, $36. Sourced from the Ross Ranch Vineyard, located in the hills southwest of Sebastopol. Goldridge sandy loam soil. Clones 115 and Pommard. Aged in 50% new French oak barrels. · Light reddish-purple hue in the glass. Vibrant aromas of fresh red fruits, especially cherry glaze, with notes of spice, sandalwood and toasty oak. Explodes on the palate with melt in your mouth, perfectly ripe cherries accented by dark chocolate and spice. Very smoothly textured with gossamer tannins and noticeable persistence on the fruit-filled finish. Shows the most oak influence of all the Bailiwick wines this vintage, but it is not intrusive. Very good (+). Visit the website at www.bailiwickwines.com to purchase wines online. A 2010 Cabernet Franc and 2011 Vermentino are also offered.